Seahawks tight end Jimmy Graham is lost for the season after tearing his patellar tendon in his right knee during the fourth quarter of Seattle’s 39-30 victory over Pittsburgh. The up-and-down first season for Jimmy Graham as a Seahawk ended in the worst fashion possible Sunday as he tore the patellar tendon in his right knee in the fourth quarter of a 39-30 win over the Pittsburgh Steelers. Graham will have surgery and is done for the year, coach Pete Carroll said after the game. Carroll said he had no specific timeline for when Graham will return. The patellar tendon is the structure that connects the kneecap (patella) to the shin bone (tibia), as described by Orthopedics.com. Graham was injured while attempting to catch a pass in the end zone from Russell Wilson with 13:41 to go in the game. The ball appeared underthrown and Graham went down as he tried to battle for it with Pittsburgh’s Antwon Blake. Luke Willson will now step into the starting role and called the news of Graham’s injury “tough.” Willson caught a 12-yard pass on the play after Graham’s injury, something Carroll said wasn’t a coincidence. “I think it was a little bit of something that (offensive coordinator Darrell Bevell) wanted to hit,” Graham said. Willson has had to step in for injured players before, including Zach Miller after three games last season. So he’s used to the role. Still he said it won’t be easy to replace Graham. Graham, acquired in a much-balleyhooed trade in the off-season in which the Seahawks sent Max Unger and their first-round pick to New Orleans while also getting back a fourth-round pick, finished the season with 48 catches for 605 yards and two touchdowns with a long of 45. DeShawn Shead started in place of veteran cornerback Cary Williams, and it was not a last-minute decision. Shead knew earlier in the week that he would start opposite Richard Sherman. The Seahawks elected to not even suit up Williams on the 46-player game-day roster, which came a week after Williams was benched midgame. Williams, 30, has struggled to refine the complicated technique the Seahawks teach their corners, and he has struggled in coverage. Shead is the pocketknife of Seattle’s secondary. 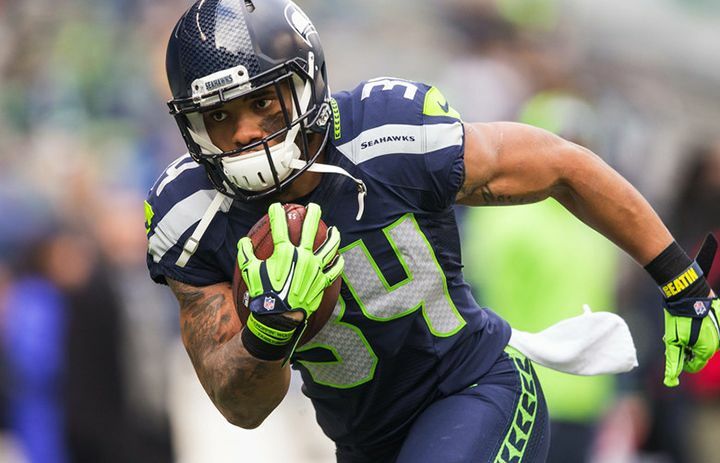 He started at safety during Kam Chancellor’s holdout and at nickel cornerback while Jeremy Lane was injured. But Carroll said he wanted to give Shead a shot at outside cornerback. Shead wasn’t perfect. He gave up a 40-yard catch to Martavis Bryant and was part of the equation in allowing Markus Wheaton and Bryant to combine for 270 receiving yards. But he also knocked away a few would-be big plays and drew praise from his teammates and coaches. Whether Shead is the starting cornerback going forward is unclear. The Seahawks could give Williams another chance, and Jeremy Lane is an option, too. He played in his first game and warmed up as Shead’s backup before the game. Cornerback Jeremy Lane made his first appearance since suffering an ACL injury and broken wrist in the Super Bowl. And he didn’t need long to make a splash with an interception of Pittsburgh QB Landry Jones on a fake field goal to start the second quarter. Lane returned the pass 54 yards to set up Seattle’s first touchdown. Lane later played the second half at nickelback after an injury to Marcus Burley. Lane said he played more than he thought and acknowledged it took some time to shake off the rust. Seattle defensive tackle Ahtyba Rubin will add the ball he intercepted to his trophy case, but it isn’t his first interception-turned-souvenir. It’s actually his second. Rubin, a 325-pound defensive tackle in his first year with the Seahawks, picked off Steelers quarterback Ben Roethlisberger attempting a short pass in the third quarter and led to a Seahawks’ touchdown two plays later. The NFL announced Sunday that Seattle’s game at Baltimore on Dec. 13 will be flexed out of its prime-time slot and will instead start at 10 a.m. PT. NBC will instead show New England vs. Houston.